Do you know..The office or house must provide a comfortable and easy maintenance of flooring.. There is a spill of various types of foods and drinks that can create damage to the floor and it not only affects the dirty but also does not last long. So! the carpet tiles is the best way to easiest you to replace some damages part on your carpet as easy as 123. Do you want to know more about it? All these features are available on our carpet tiles. Pssst! If you want to know #alaqsacarpets have 8 awesome designs!, get an idea of the various Variations from our experts at #ALAQSACARPETS. 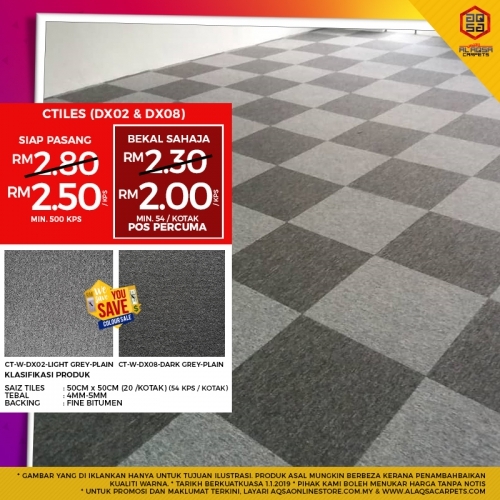 The largest and cheapest carpet tiles supplier in Malaysia.